Here’s a look at the numbers behind some of the biggest sports stories this past month. Send us suggestions for next month’s edition by tweeting at @michaelkruse with the hashtag #GrantlandStats. Estimated number of workers in America who filled out March Madness NCAA tournament brackets in an office pool: 30 million. Number of people who participated in the Tournament Challenge on ESPN.com: 6.45 million. Percentage of those people who picked the entire Elite Eight right: 0.5. The entire Final Four: 0.4. What the first two days of the tournament cost employers in lost productivity: $175 million. What CBS is paying the NCAA over 14 years for the right to air its men’s basketball tournament: $10.8 billion. Amount of spending the tournament generates, including advertising, merchandise, and corporate sponsorships, adding up to roughly Iceland’s gross domestic product: $122 billion. Number of states that cut higher education funding last year: 41. Percentage by which inflation-adjusted state support for higher education has fallen over the last five years: 12. Percentage by which inflation-adjusted tuition at four-year public colleges has gone up over the last decade: more than 70. Percentage of Americans aged 16 to 24 who were enrolled in college in January — an all-time record: 60. Times the University of Louisville and the University of Kentucky had played each other in the Final Four before this year: 0. Kentucky coach John Calipari’s salary this year: $3.8 million. What he made on top of that for winning the SEC regular-season championship: $50,000. For making the regional semifinals: $100,000. 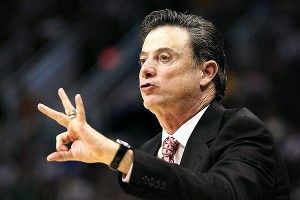 Louisville coach Rick Pitino’s salary this year: $3 million. What he made on top of that for winning the Big East tournament title: $50,000. For making the regional semifinals: $50,000. Percentage by which the governor of Kentucky’s current proposed budget cuts funding for higher education in the state: 6.4. U of L’s proposed budget cut: $9 million. UK’s proposed budget cut: $19.4 million. Amount by which state funding for U of L will have been cut between 2008 and 2014: $27 million. And for UK between 2008 and 2013: about $50 million. The annual salary of University of Alabama football coach Nick Saban after he got a raise this month: $5.3 million. The annual salary of the University of Alabama’s tight ends and special teams coach after he also got a raise: $350,000. The median annual pay for an employee at the University of Alabama: $45,758. The median pay for a full-time worker in Tuscaloosa: $33,000. The amount of money that has been cut from the higher education system in California since 2007-08: $2.7 billion. The amount of money a group led by Magic Johnson paid for the Los Angeles Dodgers: $2 billion. Number of goals Lionel Messi scored in one Champions League game on March 7: 5. Number of times Tim Tebow said “excited” in his Jets press conference March 26: 44. Reporters at that presser: more than 200. Percentage by which attendance in college basketball’s major conferences was down this year: almost 6. Average number of social media comments made per game on the first weekend of the tournament: 49,000. Percentage of kids who would rather play video games than sports: 42. The world rank of the University of Miami in quidditch: 1.